Kenny”s back in the house and we are really pleased! (borrowed from new Auckland Mayor Len Brown) . For those that don”t know Kenny has been in England for most of this year – but he”s back home in Christchurch and already making his presence felt. 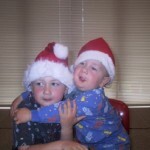 Kenny is running in this year”s Santa run and 50% of the funds he raises is for Cleft NZ. Thanks Kenny. Please support Kenny by sponsoring his initiative, or if you think this is a cool idea and gr8 way to help Cleft NZ, then maybe you want to do the Santa run too. For all you need to know, go to Kenny”s Santa run website. We love you Kenny 🙂 – your enthusiasm, endless ideas and ability to just get things done is an inspiration. The Santa runs are in all the main centres, so we may even get to meet each other at the events!